Agatha's husband works in the Foreign Office, and she is certain he will ensure that the recent sabre rattling over the Balkans won't come to anything. And Agatha has more immediate concerns; she has just risked her carefully built reputation by pushing for the appointment of a woman to replace the Latin master. When Beatrice Nash arrives with one trunk and several large crates of books, it is clear she is significantly more free thinking - and attractive - than anyone believes a Latin teacher should be. For her part, mourning the death of her beloved father who has left her penniless, Beatrice simply wants to be left alone to pursue her teaching and writing. 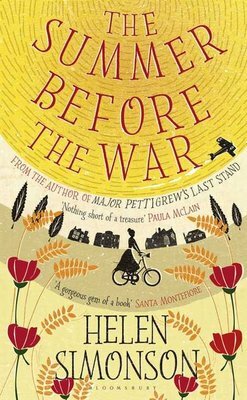 But just as Beatrice comes alive to the beauty of the Sussex landscape, and the colourful characters that populate Rye, the perfect summer is about to end. For despite Agatha's reassurances, the unimaginable is coming. Soon the limits of progress, and the old ways, will be tested as this small Sussex town and its inhabitants go to war. The Summer Before the War is a beautifully written, uplifting story. Well developed, strong characters which were so realistic I felt as though I had known them for years and still expect them to be in my life. The story is written in such a way that allows the reader to glide gently, almost dreamily through the pages. This in turn allows the cruel, brutality of the war to stand out.